Brads of all sizes, colours and styles. 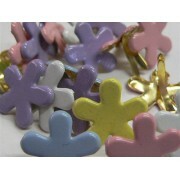 The ideal embellishment for your scrapbook layout or crafting project. Paper fasteners include paper clips, scroll clips and turns & mounts.